The effects of alcohol on fertility are greater than you may think. Even moderate alcohol consumption may lower fertility. Alcoholic beverage consumption is well accepted in most countries worldwide. As infertility rates increase, we have to wonder if regular alcohol consumption may contribute to this problem. We all know that heavy drinkers have a greater risk for all sorts of health problems, but what if you drink 5 or less alcoholic beverages a week? Research shows, even women who consumed 5 drinks or less a week each had lowered fertility. The good news is that moderate alcohol consumption did not affect the length of time it took the couples to get pregnant. Those couples who drank more than 5 alcoholic beverages a week took longer to conceive. One study out of Denmark in The BMJ (formerly the British Medical Journal) performed over a 3-year period, with 430 couples ranging from age 20-35 years of age, showed that women who drank five or less alcoholic beverages a week had lowered fertility. After a 6-cycle follow-up, 64% of the women who drank 5 or less alcoholic beverages conceived, compared to 55% of women who drank more than that a week. The study did not show men to have lowered fertility, and the amount of alcohol intake did not matter. This older study’s conclusion on the effects of alcohol consumption, has a stark contrast to another recent study published in 2011. This newer study published by Fertility and Sterility, focused on male fertility, concluded that men who drink alcohol regularly, have lower sperm motility and concentration. They also had reduced chance of fertilization. Women and men should avoid consuming alcohol while trying to conceive. Women who consume more than 5 alcoholic beverages a week take longer to get pregnant. Women who drink 5 or less alcoholic beverages a week have lowered fertility. Infertile women who seek medical care for their fertility issues, have been shown to have a significantly higher alcohol intake than women who become pregnant naturally. Men who regularly consume alcohol have lower sperm motility and concentration, as well as lowered chance of fertilization. Alcohol depresses the adrenal glands and slows the release of hormones produced by the adrenal glands. This may directly impair egg health and libido. In men with poor sperm quality, excessive alcohol consumption was associated with decreased numbers of normal sperm. Alcoholic beverages contain a lot of sugar. Excessive sugar consumption decreases fertility by contributing to hormonal imbalance, insulin resistance, yeast infection, vitamin and mineral deficiency, and lowered immunity. All of these may impair fertility for both men and women. Drinking alcohol around the time of ovulation lowers your chance of successful conception. Several studies on the effects of alcohol on monkeys and rats showed multiple fertility problems including, amenorrhea (delayed/absent menstrual cycle), reduced ovarian weight, lowered hormone concentrations, inhibited ovulation, and interference with sperm cell transportation through the fallopian tube. Human trials have shown frequent alcohol consumption by women to increase incidence of the menstrual disorders amenorrhea, dysmenorrhea (painful menstruation) and irregular menstrual cycles. It is well known that women who drink alcohol during pregnancy may cause major health problems for their baby. Excessive alcohol consumption throughout pregnancy is teratogenic (ability to cause birth defects), resulting in fetal alcohol syndrome (FAS). Drinking in pregnancy may increase risk of miscarriage, pre-term labor and delivery, placental abruption, and stillbirth. Study results are clear; alcoholic beverages should be avoided while trying to conceive. 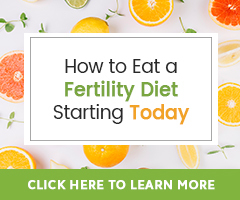 If you already struggle with fertility issues and you are wondering if consuming alcoholic beverages is contributing to your troubles, it may be time to quit. It is also time to quit if you know you have a drinking problem. If you drink regularly, especially more than 5 drinks or more a week, quitting can be very difficult and will require help from family, friends, and possibly your health care practitioner or counselor. Quitting alcohol is going to increase your fertility overall, as well as your long-term health. For women, quitting prior to trying to conceive will help you to avoid alcohol during pregnancy, where the risks of negative impact on the health of your pregnancy and baby increase. Men who desired to support their partners in creating a healthy child should also avoid alcohol while trying to conceive. Couples who are going for expensive infertility procedures such as IVF, should definitely quit drinking alcohol, at least 3-6 months prior to any procedure. The cost of medical infertility procedures can be very high. It is not worth the risk of possibly impairing the outcome of the procedure by regularly consuming alcohol. I drink about 4 bottles of cider a week. I have been trying to get pregnant for 11 month and nothing? is my alcohol consumption the problem? I’ll be honest, I don’t know! We share of a study here that found consuming five or less alcoholic beverages a week lowered fertility a group of women. With that, it may be time to cut back a bit or all together, and consider talking to your doctor about what might be preventing natural conception. I think the higher cases of infertility are due to GMO’S and other chemicals we are eating and drinking. These are causing infertility in greatest rates. Only my opinion. Alcohol (wine) has been drunk for centuries and there was not problems with infertility. This has been a very educative and helpful article to me because I have a problem of infertility.